At about this time the USCTs of the Ninth Corp’s Fourth Division had entered the battle. Part of one brigade ended up in the confusion of the crater itself, but much of the division managed to maneuver to its right and into the confusing and complex chain of earthworks that extended outward. A couple of regiments pushed their way to some of the most forward positions that any Union regiment would occupy this day. They performed admirably in what was a difficult situation. “This breakthrough would have likely ended the war,” said Park Ranger Randy Watkins, who blames incompetent Union commanders, who in a last minute decision pulled a well-trained group of U.S. Colored Troops from the frontlines to replace them with less experienced white soldiers. “The Union should have won this battle,” Watkins said. It’s as if we want the difference between victory and defeat to rest on the racism of the Union high command. “If only Meade had more confidence in these men….” Meade simply did not believe that these men stood a better chance of success compared to the white soldiers and their use came with political risks. Much of this is based on the well told tale that the Fourth Division had been trained specifically for this attack. It is true that they trained, but it must be remembered that this would be their first real taste of battle. While a few regiments may have performed drills tailored to a cratered landscape the evidence suggests that much of their training was done as part of any attempt to prepare green troops for battle. “The Battle of the Crater stands for the resolve of the Southern man,” said re-enactor Michael Peacock, a Texas native who now calls Midlothian his home. “To Confederate soldiers, there was no surrender. This ran deep in their veins and still does,” he said. Sam Watkins, who portrayed a private in the Confederate artillery, said that the Battle of the Crater was more important than the Battle of Gettysburg. “This right here was the defense of Petersburg,” he said. Indeed, there was no surrender…no surrender that is for many of the black soldiers in the Fourth Division. And this had everything to do with the fact that they were defending a civilian population in Petersburg. Whatever ran “deep in their veins” it was excited by the fact that the site of black men in uniform solidified what the war was about and what the consequences would be if a Confederate victory in this battle and the war were not secured. Note: For those of you visiting the battlefield my book is now available at the Petersburg National Battlefield book store. Writings by some Union vets also cast doubt on the notion that the white troops replacing the USCTs were hopelessly demoralized and unfit to fight. 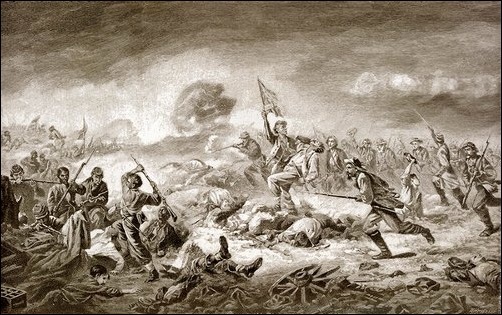 The historian of the 115th New York recalled that they heard an inspired yell as the 9th Corps advanced. Absolutely. It’s a stretch to suggest that the black troops were somehow better prepared to lead the assault compared to their white comrades. So many factors played into the outcome of this particular battle. Even under the best conditions plans for large scale assaults often went awry. General Ferrero’s testimony to the Joint Committee on the Conduct of the War, given on December 20, 1864 at City Point, argues his men would not have been inclined to take shelter as Ledlie’s men did, had they been given the opportunity to lead the advance as originally planned. He makes a very strong case. What would you expect him to say? Next post: Who Is a Victim of History?